Summer slide is the academic loss children experiSummer slide is the academic loss children experience during summer break from school. Children who don’t read during the summer can lose up to three months of reading progress, which can have a long term negative effect.ence during summer break from school. Children who don’t read during the summer can lose up to three months of reading progress, which can have a long term negative effect. 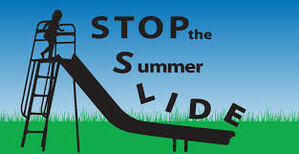 For information on ways to combat the "summer slide", please click here for an informational slide show. Wisconsin Business World is a program of WMC Foundation aimed at providing high school students with economic and financial literacy education, while teaching the importance of free-market enterprise. Business World hosts three four-day summer camps each year and numerous one-day ?mini? programs during the school year for school districts around the state. WCATY offers an array of day and residential precollege academic summer programs for students in Grades 1-12. Our classes provide ongoing engagement and academic challenges in a broad spectrum of disciplines.